In an unusually diverse collection, Margaret Jacob presents the eighteenth-century movement known as the Enlightenment that forever changed the political, religious, and educational landscape of the day. Selections by some of the period’s most important thinkers include pieces by Locke, Rousseau, Mary Wortley Montagu, and Denis Diderot. New additions to the document collection include excerpts from Peter Bayle’s Historical and Critical Dictionary as well as The Indiscreet Jewels, Diderot’s novel set in the Congo but clearly aimed at the French court. Jacob covers the movement’s lengthy evolution in a comprehensive introduction, which establishes the issues central to understanding the documents and provides important background on the political and social debates of the period. All documents are preceded by headnotes, and the volume includes a chronology, map, illustrations, and an updated bibliography and index. A list of Questions for Consideration has also been added for this edition. "This is an excellent collection. 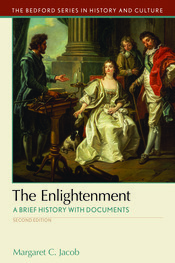 The clear and elegant introduction usefully discusses many current topics of interest regarding the Enlightenment, including the role of religion, the cultural processes of criticism, the social and gender status of the 'enlightened,' and attitudes toward non-European societies and peoples. The well-chosen documents, combined with the author's fine introduction, should make this a very effective text for use in the classroom."